Two rivers, and their contrasting personalities, shape the landscapes of Assam and the lives of the people and creatures that inhabit this land. Published in Yahoo India’s travel section, on 17th Dec, 2014. This is about a river, as tempestuous as an artist. But, who can deny his artistry? The swamps that cool the rhinos, the tall grass that screens the elephants, the waters that shield the dolphins, the soil that sustains the trees - they’re all his design. He gives life; he takes lives too. Winding his way through India’s eastern arm, the mighty Brahmaputra heaves each monsoon. And, they all move in ritualistic unison: the rhinos, the elephants, the deer and the humans. They know the drill. When most of your land is going to be submerged, you move to higher ground; it is a question of survival. After the survival, will be the time of plenty. Yet, minds fill with dread - will I survive until the next season or will I perish before the rains stop? 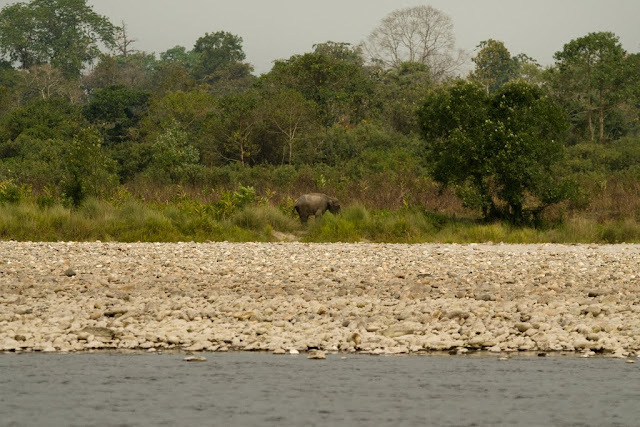 Before the Brahmaputra stops? These worries are not unfounded. This story is also about another river. 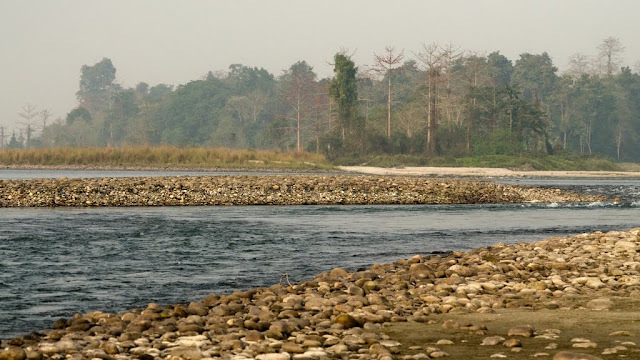 Not far from Kaziranga flows the Jia Bharali (pronounced Jia Bhorali), her name evoking a musical tinkle. Unlike the Brahmaputra, she exudes stability and calmness. Genteel in her ways, her banks are bordered by white sand and pebbles, gradually leading to a lush green forest, where birds thrive. So do elephants, gaur and tigers. 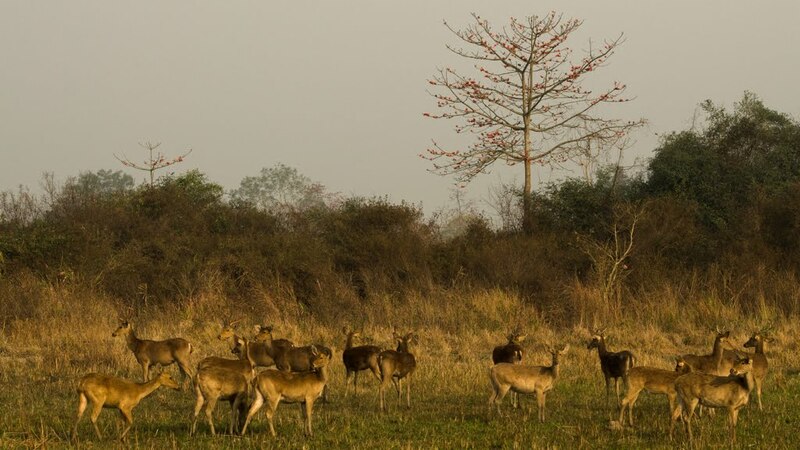 Jia Bharali is the thread that ties the Nameri National Park together. As she makes her way south to meet the sea, she is intercepted by the Brahmaputra. They seamlessly meld. Now shorn of her identity, she flows along, a willing ally to Brahmaputra’s ways - an ally to the necessary destruction. 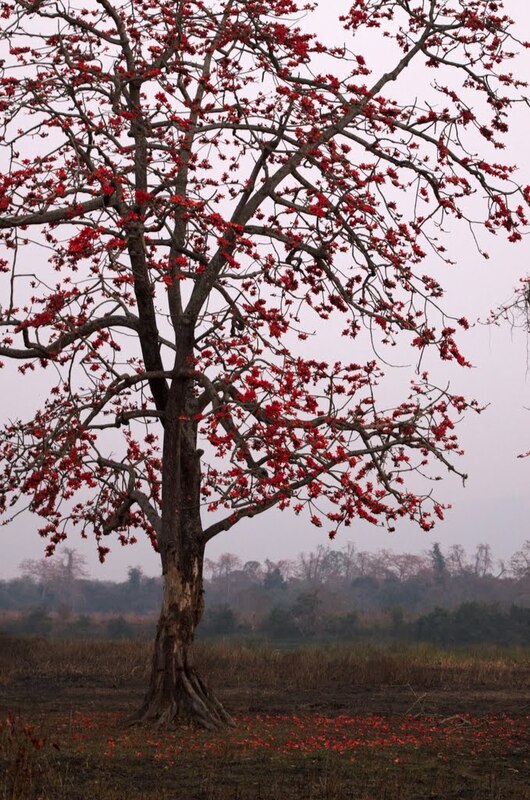 Here, I ask again – who can deny the Brahmaputra’s artistry? Nobody. Which is why, man and beast unquestioningly humour him each monsoon. And, life goes on. Or not. 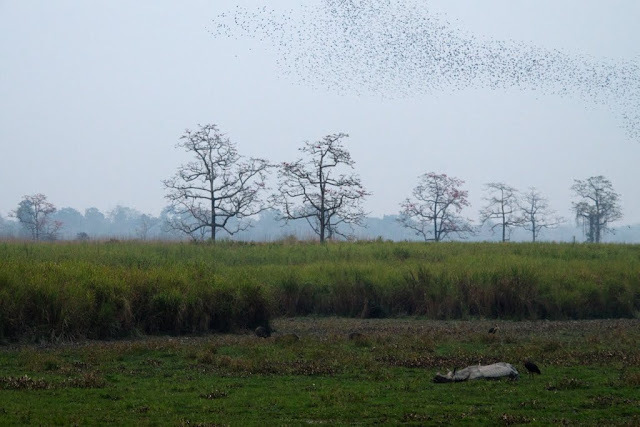 Life in Kaziranga and Nameri revolves around their rivers. Winter mornings are shrouded in a haze, with very poor visibility. Here, the Nameri national park along the Jia Bharali River slowly shrugs off the morning mist. This elephant is one of the earliest visitors to the river’s pebble-laden banks. Hidden by dunes of white sand, Small Pratincoles gather in large numbers. 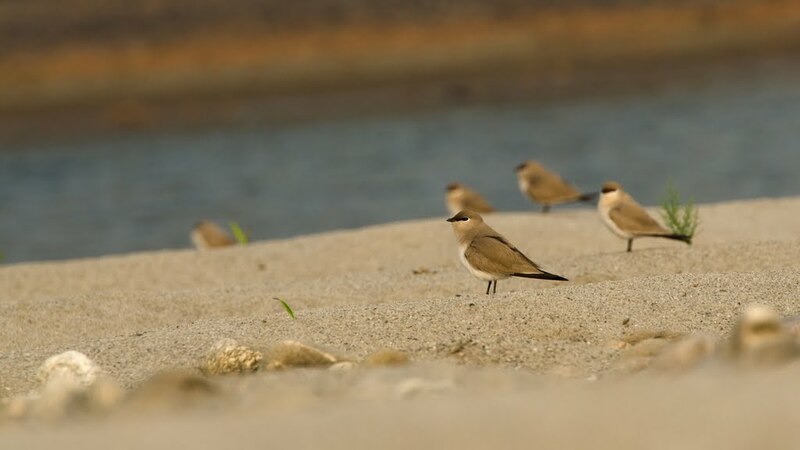 These pint-sized birds spend the rest of the day foraging for food and cleansing themselves by rolling in the sand. 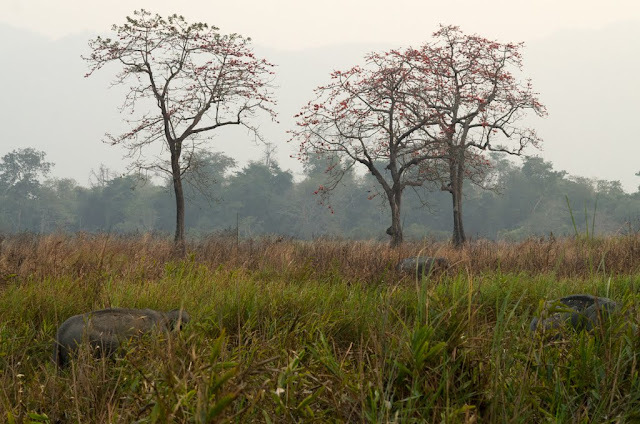 Not far from Nameri, mornings in Kaziranga sometimes reveal the unexpected. 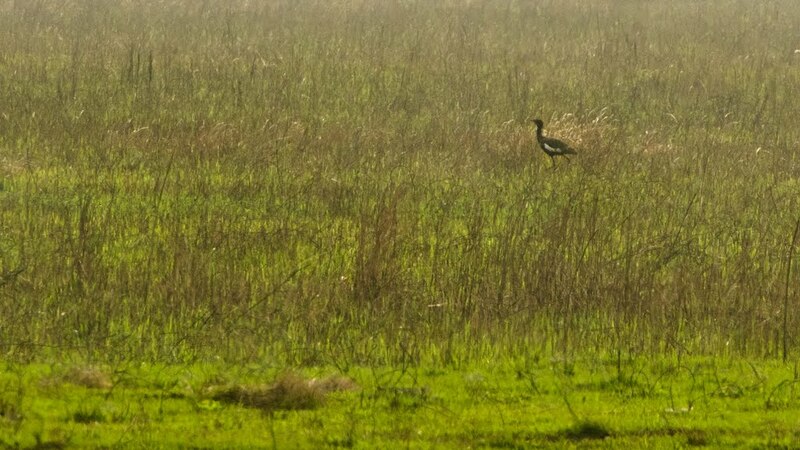 One morning, the critically endangered Bengal Florican, sighted by our hawk-eyed guide Nekib as soon as we entered the park, chased away all remnants of our sleep. Come February, Silk-cotton trees bloom and shower the forest with bright red flowers, adding to its beauty. A mundane pile of dung receives an artistic make-over. This massive pile of dung, called a dung midden, is produced by the One-horned Rhinoceros. Rhinos excrete over their specific pile and leave it as a marker for other rhinos, establishing their territory. Kaziranga is the primary home of the endangered One-horned Rhinoceros. 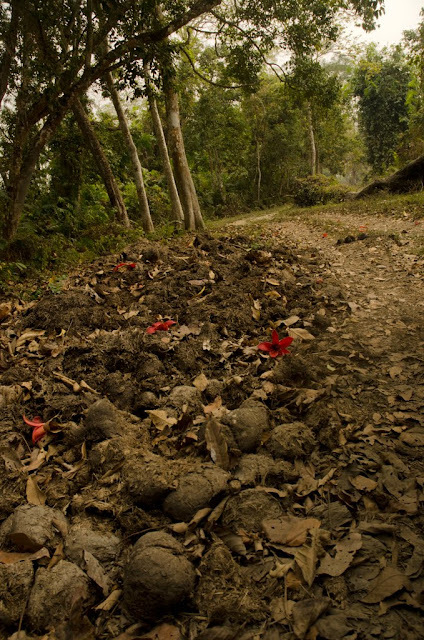 Almost 2000 of the nearly 3000 One-horned Rhinos in the world live in this forest. 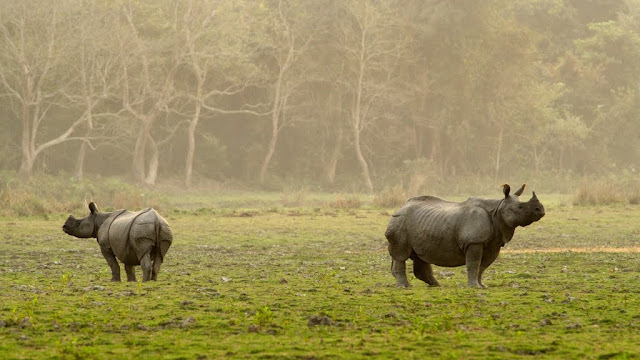 Here, a female rhino and her calf walk along the lush-green floodplains created by River Brahmaputra. 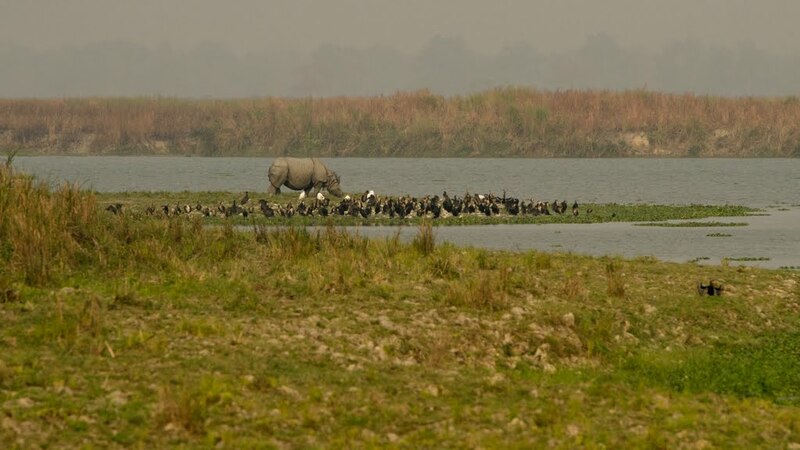 Mostly solitary creatures, male rhinos do attract the company of various birds. Rhinos are a prized catch for poachers, who target their valuable horns for use in traditional medicines. The rhino population revived itself from the brink of extinction thanks to some stringent measures. 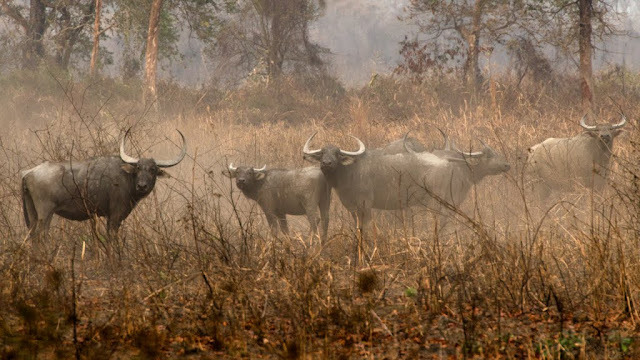 One of the measures - the presence of heavily armed guards, has helped curb poaching. 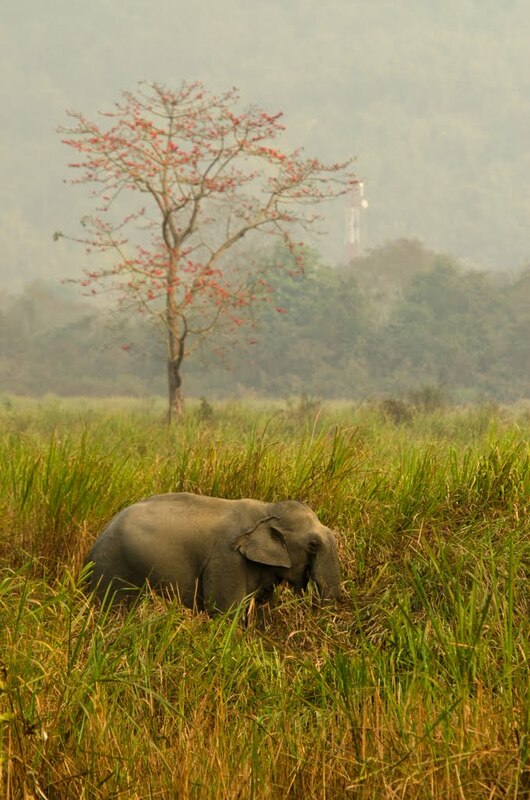 A distinct feature of the forest at Kaziranga is the ‘elephant grass’, so known because it is tall enough to conceal elephants, as seen here. 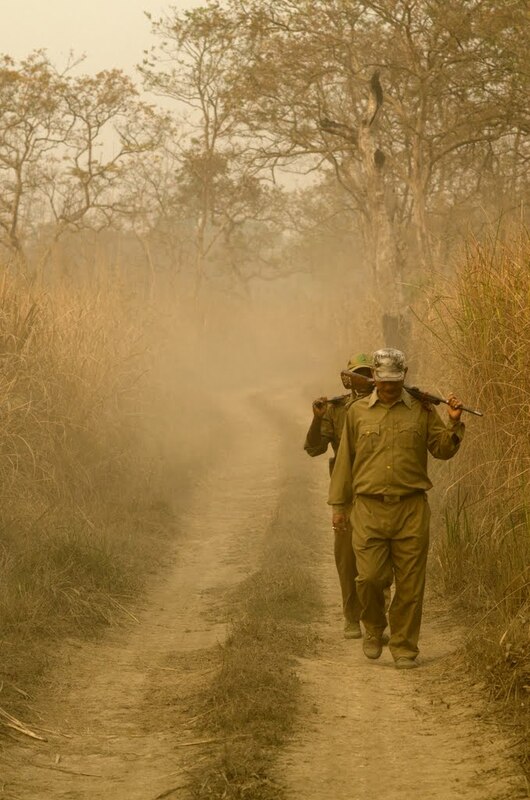 The forest department undertakes controlled burning of the grass, mostly in Jan-Feb. This is done to kill weeds and unwanted vegetation, to ensure the growth of healthy, disease-free grass post-monsoon. 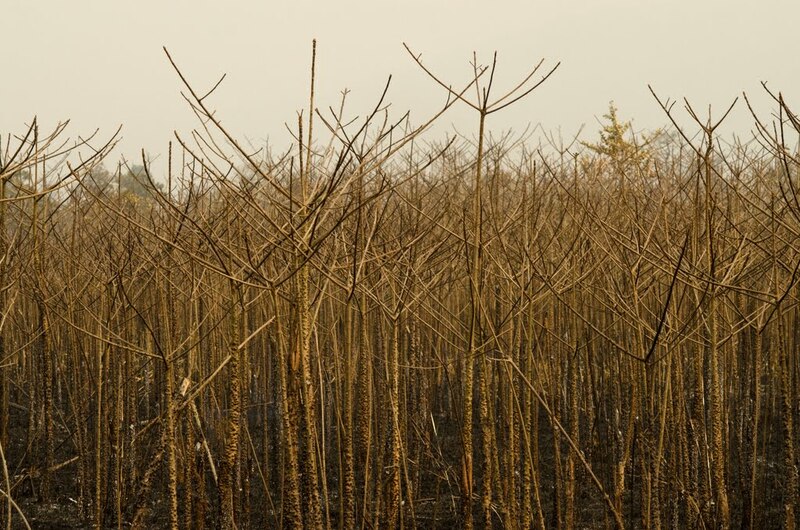 Due to this controlled burning, some patches of forest look thread-bare and brown. 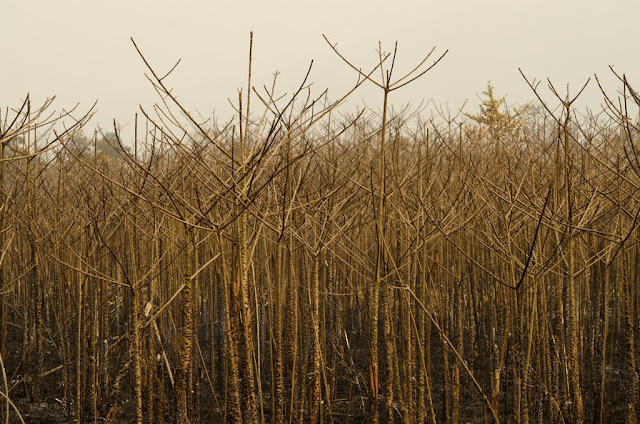 The monsoons, from June to September, result in heavy flooding of most of the forest. During this time, animals move to higher levels within and outside the park boundary. 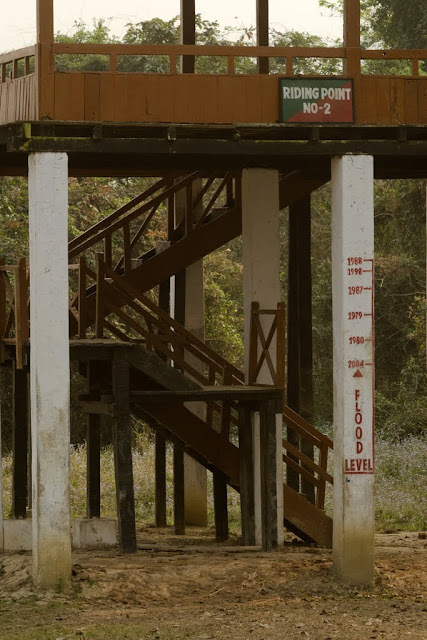 Here, markings of high flood-levels, some as recent as 2004, are a grim reminder of the annual panic caused by the Brahmaputra. The same flooding, though, is the reason Kaziranga is home to a large variety of mammals and birds, many unique to the region. One such species is the endangered Hog Deer, smaller than the ubiquitous Spotted Deer. I was lucky to see large herds a couple of times. 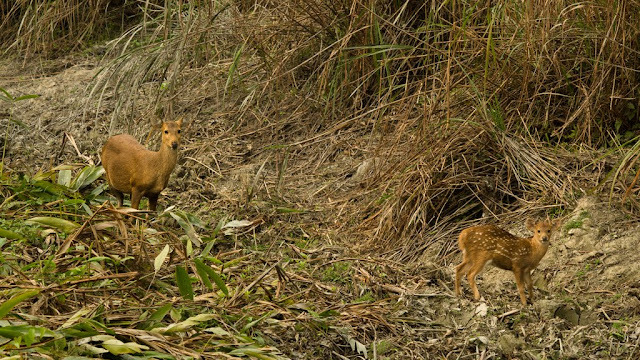 A female Hog Deer with her fawn. Juvenile Hog Deer have white spots and resemble Spotted Deer. As they mature, the spots disappear. 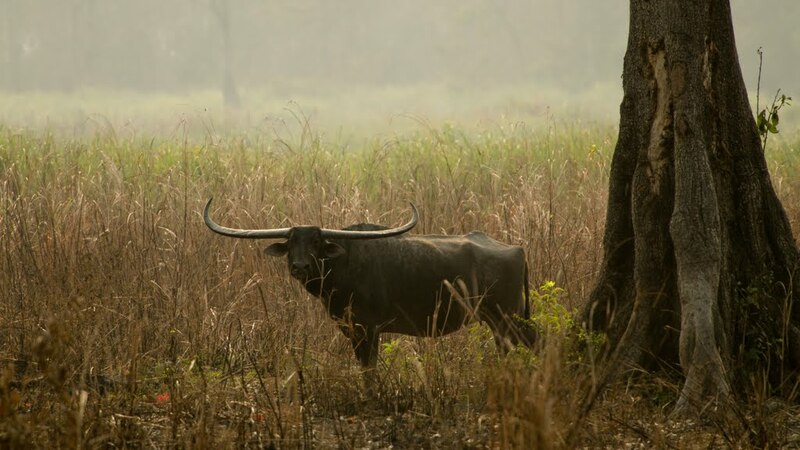 Kaziranga is home to some of the largest land-mammals in the world. Other than the elephant and the rhinoceros, another large inhabitant is the Wild Water-buffalo or Asiatic Buffalo. When not on land, they spend a lot of time wallowing in the plentiful water. 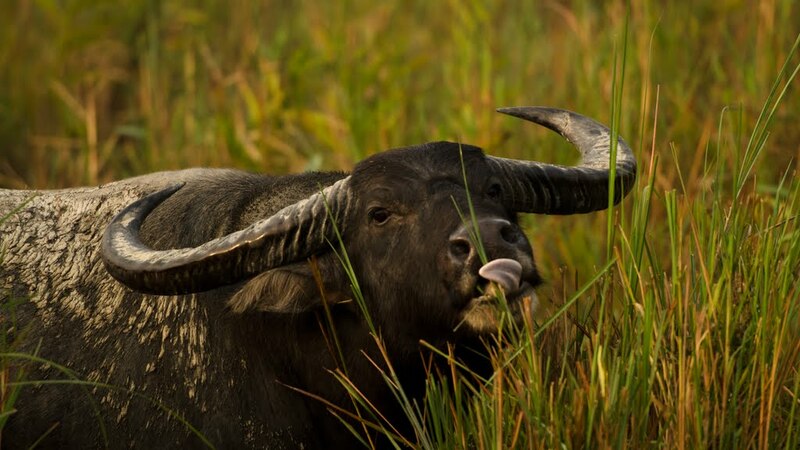 Both sexes of the Asiatic Buffalo have long horns, spreading to almost two metres wide, lending them an intimidating appearance. When these heavy-weights run, they kick up enormous clouds of dust. Here, the settling dust in the evening light creates a dramatic background for these buffaloes which have just stopped running. After the murmuration, Rosy Starlings roost on a tree, decorating it like festival lights. 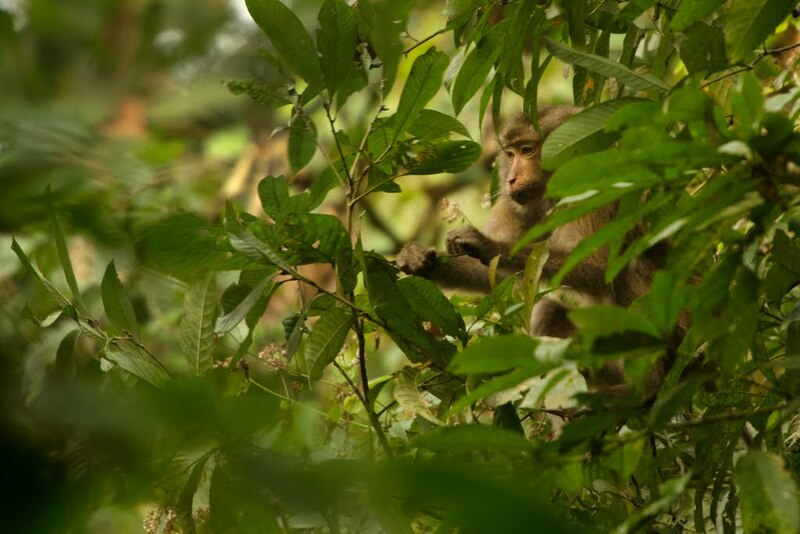 On another tree somewhere in the Hoollongappar Gibbon Sanctuary, a Northern Pig-tailed Macaque busies itself eating. Besides having a good population of the Pig-tailed Macaque and other simians and mammals, Hoollongappar is where India’s only ape, the Western Hoolock Gibbon, resides. Sighting these critically endangered apes is difficult because they’re active at higher levels of the rainforest canopy. Here, a female Hoolock Gibbon moves amongst trees with lithe movements that would put acrobats to shame. The baby gibbon’s eyes are locked on me, even as it clings to its mother. 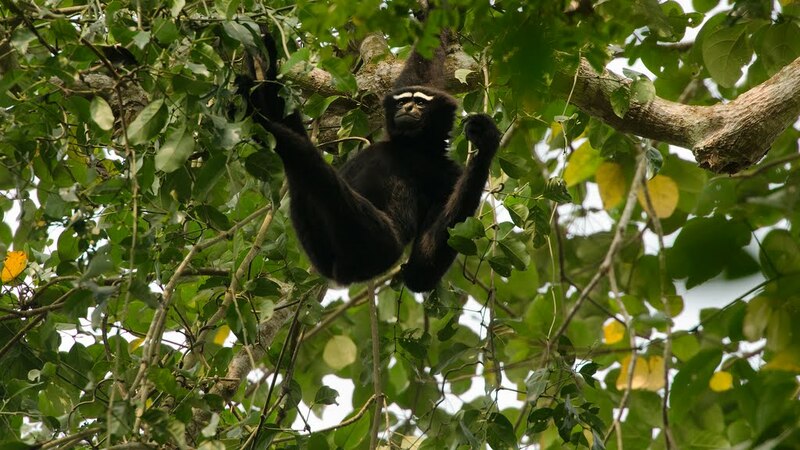 On a nearby tree, the male Hoolock Gibbon, very differently coloured from female or juvenile gibbons, enjoys a leisurely meal suspended from branches. 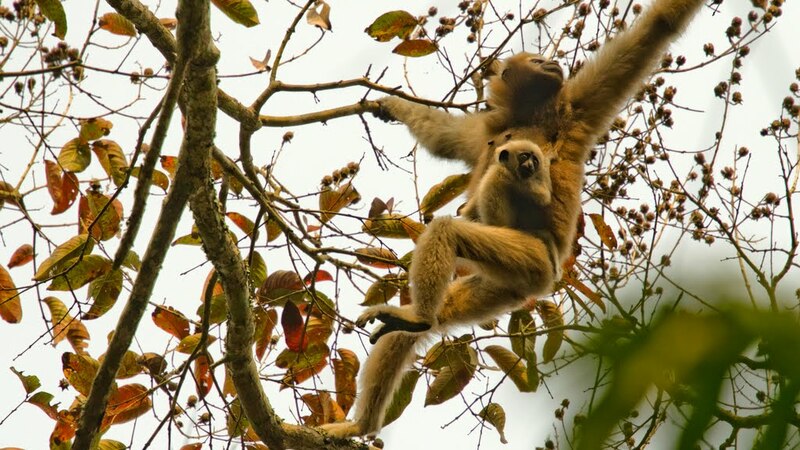 Hoolock gibbons live in monogamous pairs and families and we were lucky to sight this family together. 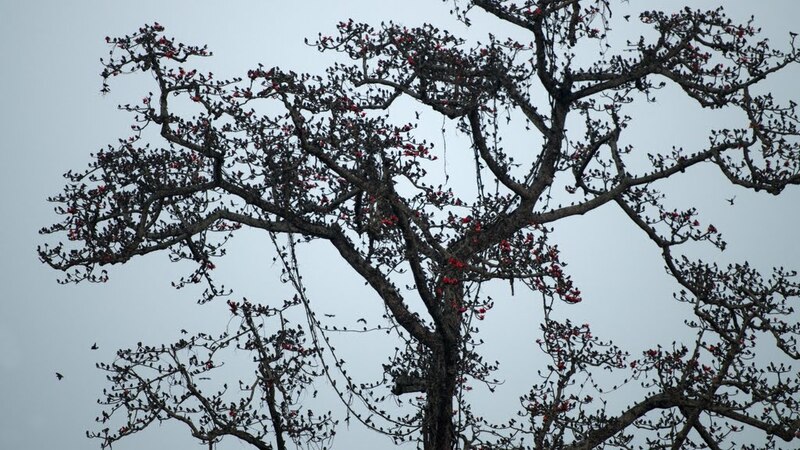 An audio recording of the deafeningly-loud ‘hoo-hoo-hoooo’ calls of a group of gibbons is one of my most treasured souvenirs from this trip to Assam. Excellent article with beautiful photographs on wildlife of Kazaringa and Nameri. love this. I think I have to travel with you sometime. Thank you, Jay...glad you enjoyed it. Enjoyed re-visiting (and e-visiting) Kaziranga and Nameri through your post. I think you are modest too much! A must do on my list, loved the photographs & a nice writeup. 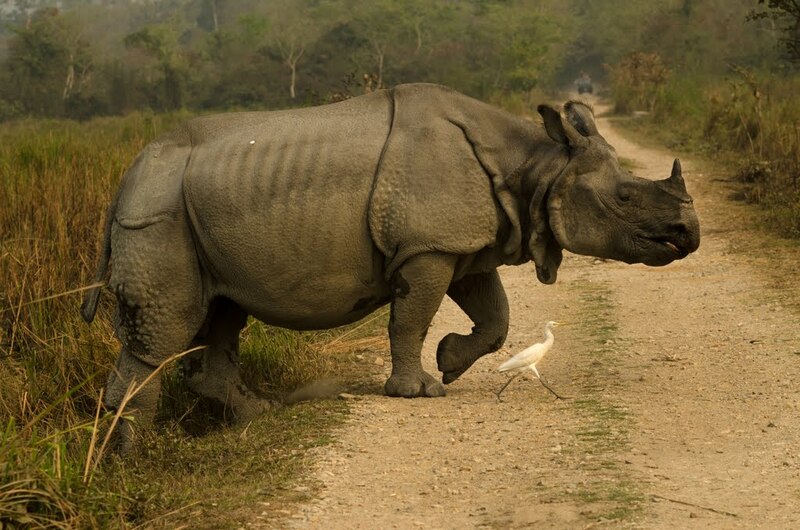 Love the photographs, especially of the stern-looking, marching egret with the rhino. Thanks, Anisha :). Welcome to the NTP family!